Eggs are a classic breakfast for both Paleo and non-Paleo eaters — whether they’re scrambled, in an omelette or served sunny side up — eggs are coveted by many breakfast lovers. Trade in your usual scrambled eggs for these convenient and cute muffin-sized egg cups. Fill the base with sauteed vegetables then cover with whipped eggs to hold the egg muffin together. It can be difficult to eat vegetables with breakfast, but this recipe provides a classic omelet vegetable mix. You can vary up the vegetables by using different vegetables, like brussel sprouts or broccoli. Don’t be afraid to use pre-cooked, leftover vegetables from dinner the night before (there’s no need to cook them again, just add to the beaten eggs). Egg muffins are a perfect breakfast to enjoy on the go – throw a couple into a bag and eat them on the way to work or after a tough workout. Plan ahead and make these over the weekend, so you’ll have a healthy breakfast on hand all week. Melt some cooking fat in a skillet over medium heat, and cook the onion and garlic until fragrant. Add the bell pepper and mushrooms and cook until soft, 2 to 3 minutes. Add the spinach, season everything to taste, and cook for another minute and set aside. In a bowl, whisk the whole eggs and the white eggs, and season with salt and pepper. 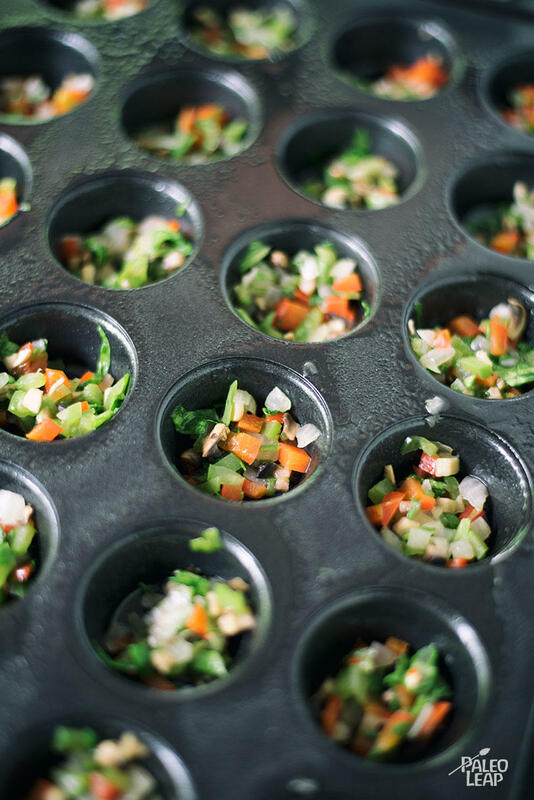 Fill each muffin tin with a layer of cooked vegetables, then top with beaten egg mixture. Place in the oven and bake 15 to 18 minutes, or until eggs are set. 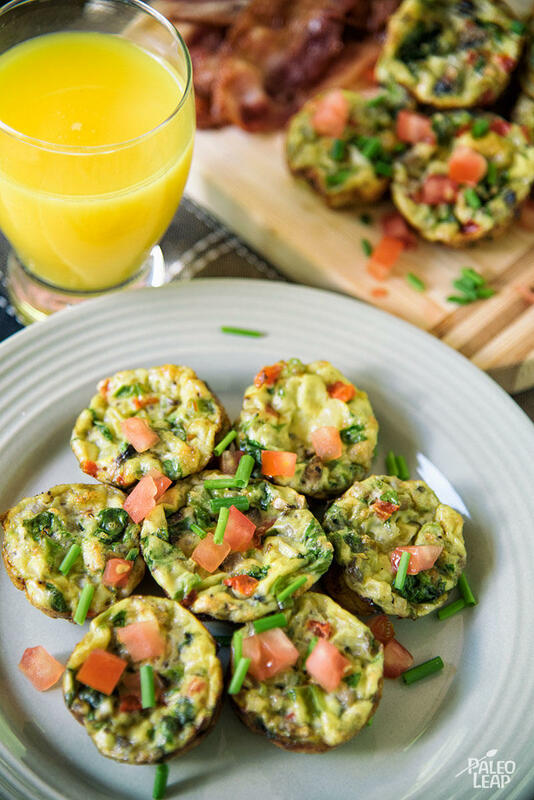 Serve the egg muffins topped with chives and freshly diced tomatoes.